Here's an October surprise of the apolitical nature! 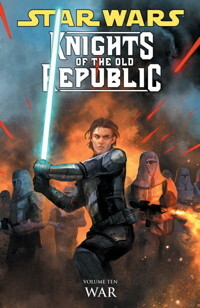 Originally slated for a Thanksgiving release, Star Wars: Knights of the Old Republic Vol. 10 - War hits shelves today. Drafted into his homeworld's militia, former padawan Zayne Carrick must survive on his own — which isn't easy, when the Mandalorians seize his unit and force him to fight as one of them. But there's another rogue Jedi with a plan who's running the show — a much different plan than the one cooked up by Zayne's corrupt former master. And this time, Zayne's not going to let him get away with it! This page has links to the production notes for all the individual issues of the series. You can get the book from your favorite retailer, or from Amazon or TFAW. I also have my first Simpsons story in many years, Bart Simpson #76, out today. Be sure to check it out!